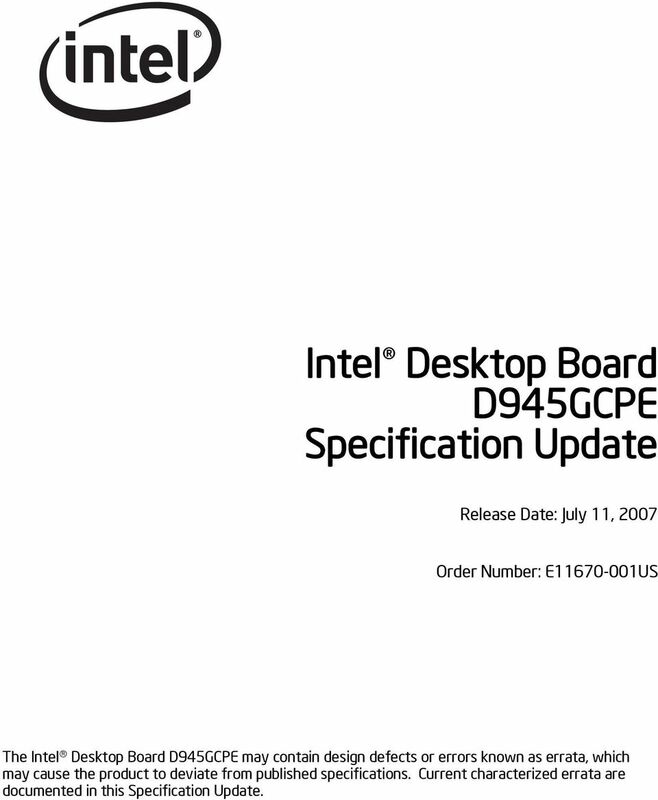 Download "Intel Desktop Board D945GCPE Specification Update"
1 Intel Desktop Board D945GCPE Specification Update Release Date: July 11, 2007 Order Number: E US The Intel Desktop Board D945GCPE may contain design defects or errors known as errata, which may cause the product to deviate from published specifications. 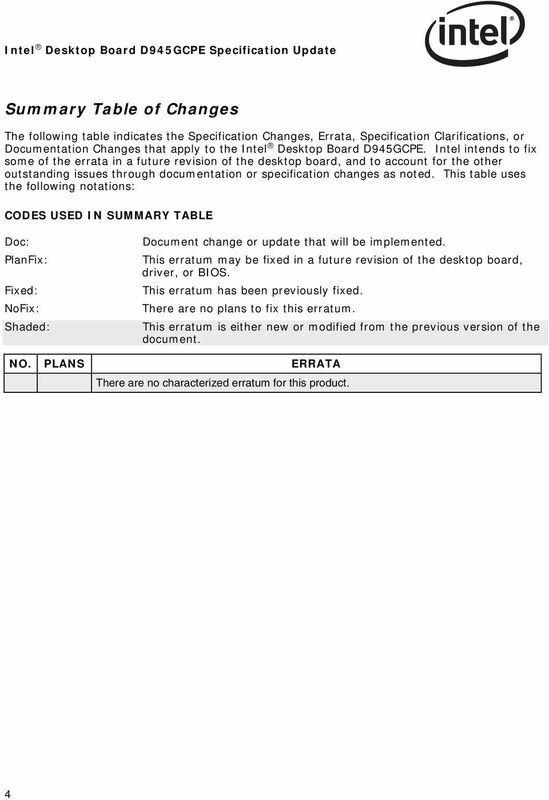 Current characterized errata are documented in this Specification Update. 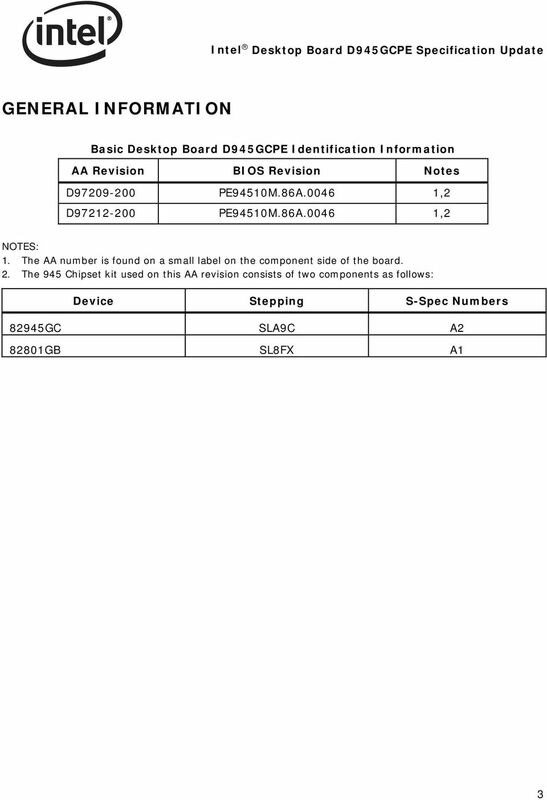 2 INFORMATION IN THIS DOCUMENT IS PROVIDED IN CONNECTION WITH INTEL PRODUCTS. NO LICENSE, EXPRESS OR IMPLIED, BY ESTOPPEL OR OTHERWISE, TO ANY INTELLECTUAL PROPERTY RIGHTS IS GRANTED BY THIS DOCUMENT. EXCEPT AS PROVIDED IN INTEL S TERMS AND CONDITIONS OF SALE FOR SUCH PRODUCTS, INTEL ASSUMES NO LIABILITY WHATSOEVER, AND INTEL DISCLAIMS ANY EXPRESS OR IMPLIED WARRANTY, RELATING TO SALE AND/OR USE OF INTEL PRODUCTS INCLUDING LIABILITY OR WARRANTIES RELATING TO FITNESS FOR A PARTICULAR PURPOSE, MERCHANTABILITY, OR INFRINGEMENT OF ANY PATENT, COPYRIGHT OR OTHER INTELLECTUAL PROPERTY RIGHT. INTEL PRODUCTS ARE NOT INTENDED FOR USE IN MEDICAL, LIFE SAVING, LIFE SUSTAINING APPLICATIONS. Intel may make changes to specifications and product descriptions at any time, without notice. Designers must not rely on the absence or characteristics of any features or instructions marked reserved or undefined. Intel reserves these for future definition and shall have no responsibility whatsoever for conflicts or incompatibilities arising from future changes to them. 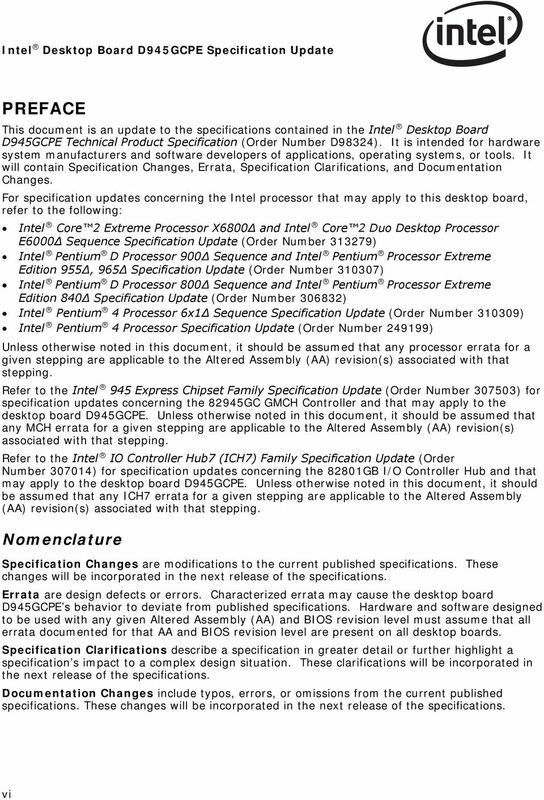 The Intel desktop board D945GCPE may contain design defects or errors known as errata which may cause the product to deviate from published specifications. Current characterized errata are available on request. Contact your local Intel sales office or your distributor to obtain the latest specifications before placing your product order. Copies of documents which have an ordering number and are referenced in this document, or other Intel literature, may be obtained from: Intel Corporation P.O. 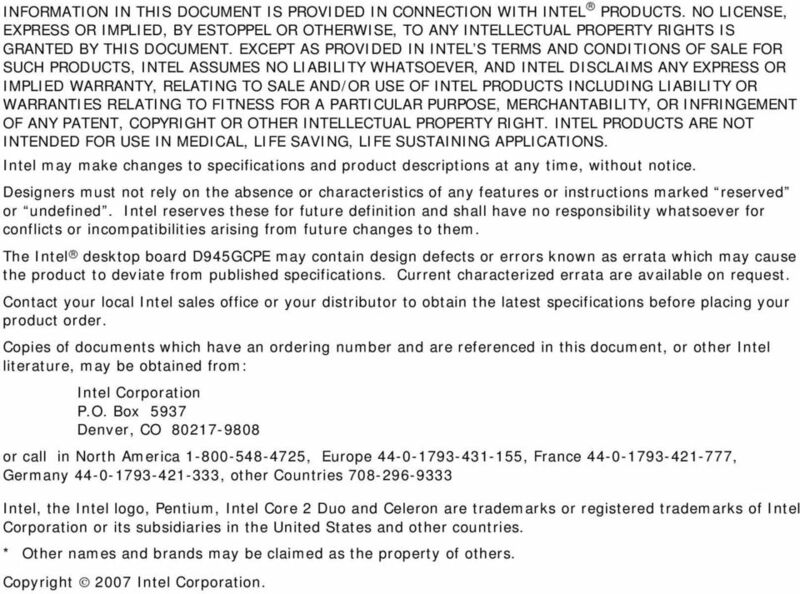 Box 5937 Denver, CO or call in North America , Europe , France , Germany , other Countries Intel, the Intel logo, Pentium, Intel Core 2 Duo and Celeron are trademarks or registered trademarks of Intel Corporation or its subsidiaries in the United States and other countries. * Other names and brands may be claimed as the property of others. 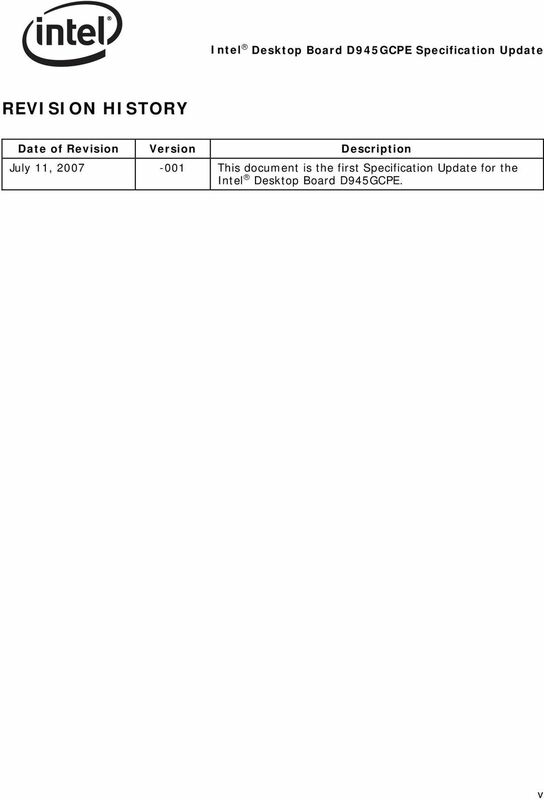 Copyright 2007 Intel Corporation. This guide explains how to install an Intel Solid-State Drive (Intel SSD) in a SATA-based desktop or notebook computer. Intel Atom Processor E3800 Product Family Thermal Design Guide October 2013 Document Number: 329645-001 Legal Lines and Disclaimers INFORMATION IN THIS DOCUMENT IS PROVIDED IN CONNECTION WITH INTEL PRODUCTS. White Paper Bruce Bao Graphics Application Engineer Intel Corporation Software Solutions for Multi-Display Setups January 2013 328563-001 Executive Summary Multi-display systems are growing in popularity. Intel Ethernet and Configuring Single Root I/O Virtualization (SR-IOV) on Microsoft* Windows* Server 2012 Hyper-V. Technical Brief v1. Vendor Update Intel 49 th IDC HPC User Forum. Mike Lafferty HPC Marketing Intel Americas Corp.
Intel Platform and Big Data: Making big data work for you.